My friend, Gillian, and I left Wednesday afternoon to visit our families in Utah. I wanted to surprise mine so I didn’t tell my Dad or my sister that I was driving up. We arrived in Utah around 4 AM (with the time change) on Thursday morning, as expected. Not much happened there. We slept, had breakfast with Gillian’s cousins and chatted with them for a while before leaving for Idaho around 1 PM to surprise my sister. We arrived at my sister’s house around 4 PM but she wasn’t home. Perfect. Everything was going according to plan and I drove around to the back of her house so she wouldn’t see the car when she got home. Gillian and I wandered around the property, taking pictures of the cows, horses and chickens. You know, what us city folk usually do when we find ourselves in a rural setting! We went into the house and had waited for no more than 10 minutes when my sister pulled into her driveway. We hid behind the front door and waited as my sister carried a baby in one arm and groceries in the other. 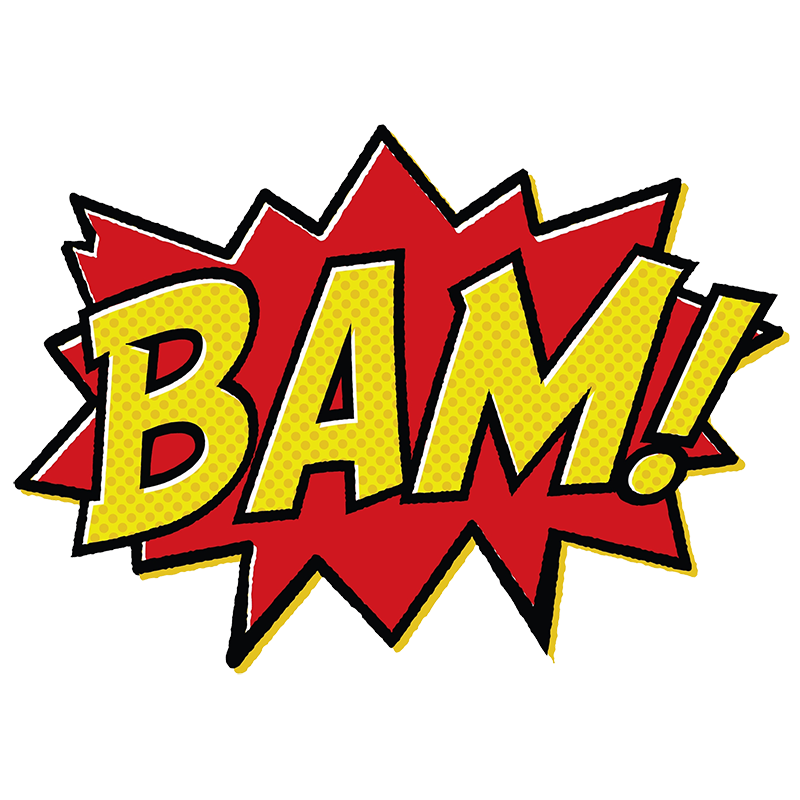 She opened the front door, walked into the house and put the baby and groceries down on the floor. I yelled, “Surprise!” and the look on my sister’s face was priceless. I’m convinced she would have dropped the baby had she not already put her down! My sister ran over to me and gave me a long hug. She was in shock for a while. It was great! We stayed the night there and drove back to Utah around noon on Friday to meet up with Gillian’s relatives. So we hung out with them for a bit before I was dropped off to meet up with my Dad. I had my sister arrange a meeting with him under the guise that she had stuff she needed to give him and asked him to meet her at Sizzler’s. Dad was sitting on the bench outside the restaurant when I pulled up. I was 5 feet away from him and he didn’t even notice me getting out of the car. Finally, he looked up and smiled when he saw me. Then he looked around and said, “Wait, where’s…” (he couldn’t remember my sister’s name). “She’s in Idaho. That was just a ruse.” I replied. We had a good laugh over it. I’m sure you’re wondering when I’ll get to the part about murder, so allow me to fast forward a little bit. We left Utah Saturday afternoon to head back home. A storm was starting to come in and the rain was off and on for a while before the darkness settled in for the night. As we neared Fernley, Nevada, the Grim Reaper decided our lives were a little too mundane to escape his deathly grasp. 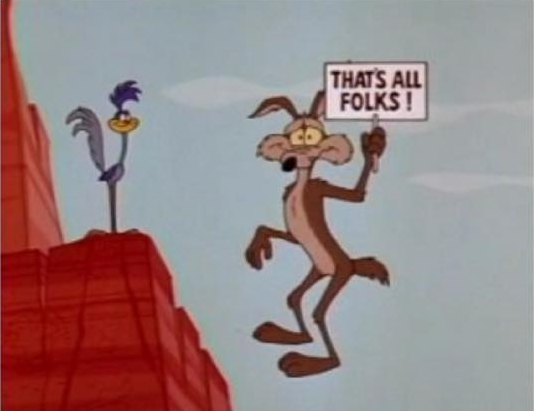 I hit Wile E. Coyote! The coyote had run back in the same direction I had swerved to avoid it, resulting in the vehicle hitting it straight on at 70 MPH. Instant death. I could hear the animal being drug for a few seconds and then there was silence. I had just committed murder. Gillian and I were so shocked that when we looked at each other we started laughing. We laughed so hard we were in tears. Nothing like this had happened to me before! I pulled into a gas station in Fernley next to Terrible’s Casino so that we could get gas before pushing on to our final destination. “Let’s check out the damage.” I said. We got out of the car and walked around to the front of the vehicle. The coyote was lodged in the bumper! Looney Tunes will never be the same. Neither of us knew what to do. We stood there in shock for a few minutes before realizing we needed to somehow get the poor thing out of the bumper. Certainly we couldn’t drive all the way to Sacramento with the poor creature lodged in the bumper! We saw a cowboy walk out of the gas station/casino market and called him over. We showed him our dilemma and asked him if he could help. He called over his girlfriend/wife and they examined the bumper. 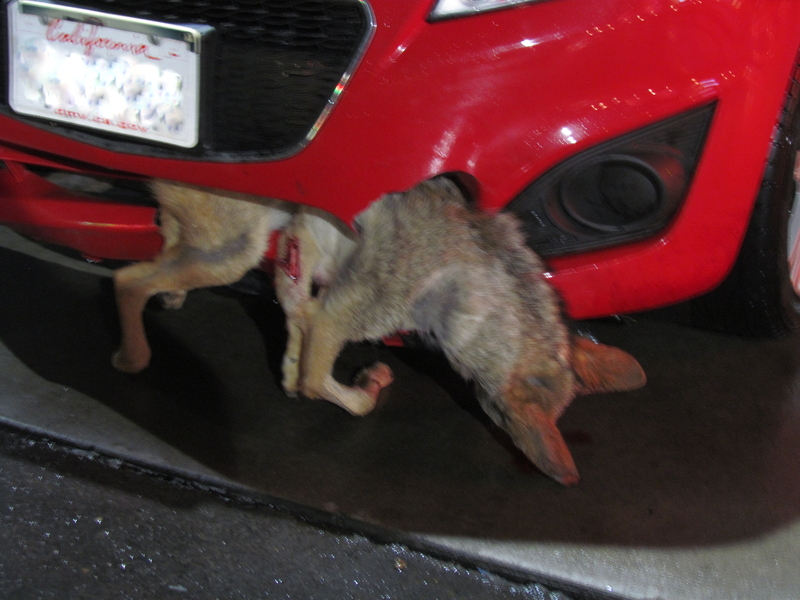 Thankfully, he was able to get the coyote out of the bumper without any further damage to the coyote. Granted, it was dead and no longer cared what happened to its mortal body, but I still respect the fact that it was one of God’s creatures and had met a terrible fate. Now we had a new dilemma, what to do with the coyote’s body. The cowboy told us to call the Sheriff’s to have animal control or whoever pick up the body. So I dialed 911, and the cowboy spoke to the dispatcher. The dispatcher wanted him to call some other number and he hung up. That’s when he took off his jacket, picked up the coyote with it and took it over to the fence near the highway and put it down where it couldn’t be seen and would now become a part of the earth. We were still in shock for quite a while after that. That’s not exactly my idea of hunting! By now it was 8:30/9:00 PM. We got gas and checked out the front of the car again. The bottom of the radiator was bent in a nicely rounded concave fashion but we decided to make an attempt to continue our journey home. We got as far as the Wadsworth rest stop before the radiator light started blinking and the car started making noise. We pulled into the rest stop and called roadside assistance. This story ends in a very ordinary way. The tow truck finally arrived and we made it home Sunday morning. Despite being less than 3 hours from home, I didn’t get home until 2:15 AM or so. Gillian, probably 4 AM. Days like these remind me why I prefer to fly! Safe and happy travels, my friends!